Your home is the most important investment you are going to make. Most people pour much of their life’s savings into a home, which is why maintaining it is extremely important. However, maintenance alone is already going to eat up a big chunk of your budget. Repairs, especially when it comes to concrete, can be such a headache; not to mention expensive. Your home is exposed to elements and harsh chemicals over time. When combined with wear and tear from living in it, the concrete that is the very foundation of your house can put you and your family at risk for flooding and bad weather. It will become accident-prone, which is not what anyone has envisioned for the house that they have invested in. You also want to be able to rely on do-it-yourself concrete projects at home, which saves you money. But such projects require curing and sealing, without which it will lose moisture due to evaporation and its strength is significantly reduced. Last but not least, no one wants to live in or visit a home that isn’t appealing to the eye. Your concrete shouldn’t just work well; it should also look good. This is why a durable water-resistant sealer is necessary. It’s a bonus when a sealer can give you a lovely finish that isn’t too glossy, so that your concrete surfaces are never an eyesore. There are all kinds of concrete sealers on the market, but only one saves you the hassle of moist curing while improving the overall strength of any concrete surface. Meet Quikrete’s Acrylic Concrete Cure & Seal, renowned for its dual-purpose, water resistant properties. Homeowners will be glad to know that this product is easy to use for sealing concrete surfaces inside and outside your home. Applying this product promotes curing because it effectively retains moisture in concrete, so you don’t have to resort to water curing anymore. It’s especially helpful for homes that are exposed to dry, warm, and windy weather because it gives your concrete added protection from the elements, shrinkage, and wear. It also repels water from concrete surfaces while it protects and seals concrete from grease, salt, acids, and other harmful substances. You can use it on countertops and even garage floors, sidewalks, driveways, and loading docks. Best of all, Quikrete Acrylic Concrete Cure & Seal is affordable and versatile. It has been designed for homeowners looking for a simple, fuss-free solution to sealing old and new concrete surfaces, as well as commercial use. The ease of use of Quikrete’s Acrylic Concrete Cure & Seal is also worth noting. In fact, for many, that’s just one of the best features of this product. Just make sure that the concrete surface you are working on is already clean and ready to accept the application of a sealer. Remove all dirt, oil stands, and other contaminants before applying. All you need to do next is to shake the bottle and apply layers either by brush, broom, garden sprayer, or roller. The product dries quickly and you’ll be able to use the concrete surface after 24 hours. Consumers can have peace of mind knowing that Acrylic Concrete Cure & Seal by Quikrete is made by one of the biggest names in concrete and cement mixes in the country. The quality of this product is a testament to their dedication to developing innovative solutions for homeowners and builders who need an affordable product that works well. The reviews of Quikrete Acrylic Concrete Cure & Seal are stellar; customers are so happy with how easy it is to use as well as the fact that it’s light on the pocket. It’s not the kind of product that you’ll have to think about, because it’s a good investment that will make sure your home is safe, protects you, and looks good – all while keeping your maintenance costs to a minimum. This water based acrylic polymer meets the ASTM C309 requirements that set the standards for Concrete Curing Compounds. It also contains 20% solids. 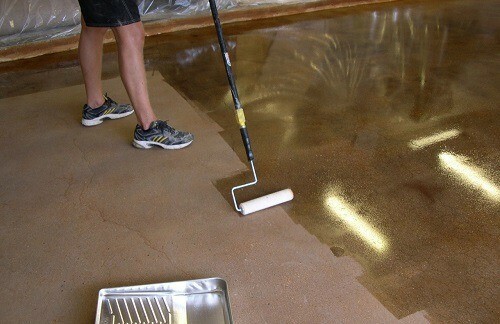 Use this water based acrylic coating for curing and sealing both old and freshly placed concrete. Save time and money by having confidence in being able to do the work yourself. This product delivers, and not just that: it’s made to produce long-term results that will make you relieved that you purchased it in the first place. Users appreciate how easy it is to use this product. Brushes and sprays are the most popular methods of applying, and its quick-drying capabilities mean that you won’t have to wait too long to use your concrete surfaces after application. A small amount will go a long way with this sealant, so the one-gallon bottle will last you a very long time. However, some users have commented about how sticky it is. Getting some product on your hands can be tricky to remove but you can avoid this by wearing gloves. Homeowners looking for a powerful and versatile curing and sealing solution for all kinds of concrete surfaces need to look no further. 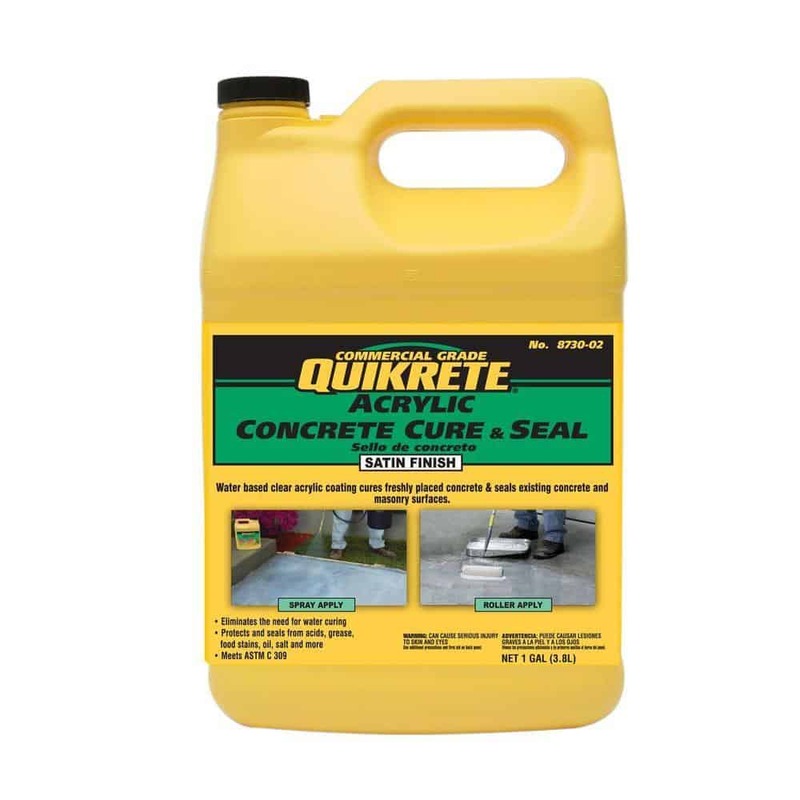 Quikrete Acrylic Concrete Cure & Seal is the product that delivers the results you deserve. It cures and seals all concrete surfaces so that you don’t have to shell out any more money on repairs and maintenance. And while other similar products on the market leave an undesirable glossy finish, this sealant leaves a lovely satin finish that is just right. It leaves surfaces looking good, so it’s no surprise that it has received dozens of satisfied reviews on Amazon.com. Trust the ability of Acrylic Concrete Cure & Seal from Quikrete to do the job well. Because it’s made with superior quality, homeowners won’t even have to work to produce their desired results. Users are raving about the simplicity and effortlessness involved in using Quikrete’s Acrylic Concrete Cure & Seal. It does exactly what it says it does, and it leaves your concrete surfaces looking beautiful whether it’s fresh or old.